I have gathered a few digiscoping tips below that will hopefully help you take better photos and videos of birds, wildlife, or any subject you desire. Simply put, it is taking photos (still or video) through your spotting scope with a digital camera. 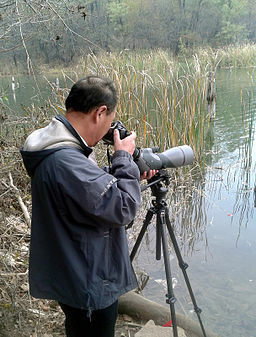 Without using this method, one would need an expensive, extremely long telephoto lens. There are a few scopes on the market with built-in cameras, but like binoculars with built-in cameras, they're not the greatest. Scopes with cameras built in have objective lens on the small size (55-70mm) as well as megapixels (~5 MP). Improvements will evolve in the future, but unless you're using your scope primarily for digiscoping and don't want the hassle of separate components, don't bother with built-ins. Here is a video explaining what digiscoping is, how to use adapters and a tip for using your iPhone headphone volume buttons to take photos. It is possible to just simply hold your camera up to the back of your scope and click away. However, depending on what your photographing, it may be difficult to hold your camera steady enough to take the shot and it not be blurry. To help with this, there are mounting brackets or digiscoping adapters to stabilize your camera. There are also rail adapters for your tripod to help with balancing the spotting scope after adding the weight of a camera setup on the scope. They even have swing adapters that move your camera out of the way when you want to look through the scope without the camera, but then bring it back again for the shot of a lifetime! The next 2 videos below explain how DSLR and point & shoot cameras can be used with Swarovski spotting scopes, but most of the tips can be applied towards other spotting scope brands. The first video (Part 1) has more information about gear, the second video (Part 2) discusses more digiscoping tips and tricks, and shooting setup. How to balance your setup, experimenting with shooting methods such as why you should set your timer, if using, to 5 or 10 seconds. Turning off auto ISO and setting the sensitivity to minimum of 800-3200 ISO, and how you generally want high shutter speed, i.e., 1/1000th of a second. Using histograms to better estimate light levels through the lcd screen with a hoodman hoodloupe, and using aperture priority or full manual to get proper exposure. The difference between digiscoping with fluid pan heads vs ball heads, using tls APR adapters optimized for cropped sensors, dealing with grainy "noise", heat waves, and more. TLS APO, DCB II, TLS 800 or DCB and the Snap Shot Adapter for EL and SLC binoculars. How to reduce "noise" or graininess in photos when digiscoping. Point-and-shoot cameras are certainly capable of shooting good photos via digiscoping, but the most impressive photos will come from a DSLR. But don't feel like you have to spend a lot of money on a new DSLR, especially if you are new to digiscoping. Go out with your point-and-shoot or iPhone and take some photos and experiment. Take photos of your backyard birds or set up your bird watching spotting scope at your local preserve, wetlands, etc..
My first photos when digiscoping weren't the greatest (see the American Goldfinch on a sunflower on our home page with all its lovely (sarcasm) vignetting - which I kind of like as an effect only as it is being used there), but it was exciting to be able to take such close-up photos without any fancy camera and/or expensive telephoto lens.